Connect directly if your bank supports a direct connection. Import transactions stored in an Excel file. You have a fourth option: You don’t have to connect at all. The following info may help you decide which approach is right for you. In QBO, you might be able to directly connect QBO Bank and Credit Card accounts to their counterparts at financial institutions. The word “might” is used because not all financial institutions support directly connecting to QBO. 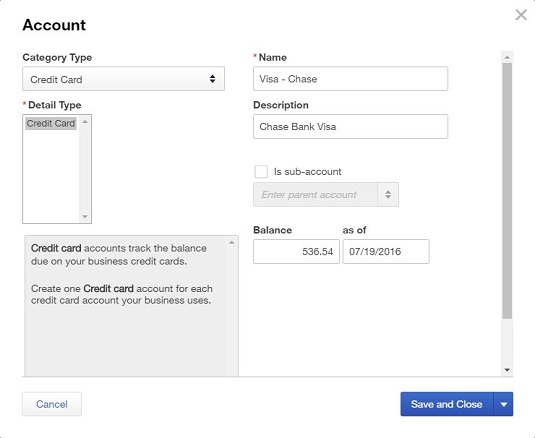 If you bank at an institution that doesn’t support a direct connection, you can use the QuickBooks web Connect method to export transactions from the financial institution’s website into QBO. It’s important to understand that you don’t have to connect. You can work along quite happily in QBO without ever connecting an account at a financial institution to one in QBO. You simply enter transactions that affect the appropriate account and, monthly, you reconcile the accounts. So, why connect? Most people connect to accounts at financial institutions so that they can electronically verify (by matching) the transactions recorded in QBO with the ones recorded at the financial institution. Connecting is, therefore, primarily a matter of convenience. When you add a new Bank or Credit Card account, you can opt to connect it to a financial institution — or you can choose not to connect to a financial institution. The method you choose to add a new account depends on whether you want to connect it to a financial institution. You typically use an Expense transaction to record credit card purchases and sales receipts to record refunds to a credit card. Click the Gear button beside your company’s name and, from the left side of the menu that appears, choose Chart of Accounts. QBO displays the Chart of Accounts page. Click the New button on the Chart of Accounts page to open the Account dialog box. Open the Category Type list and choose Credit Card. If you’re using account numbers, supply a number for the new account. Optionally, you can enter your account’s balance as it appears on the last statement. If you enter a balance, QuickBooks updates both the account balance and the Opening Balance Equity account, and your accountant probably won’t be happy with you. You can choose not to enter a balance. QBO redisplays the Chart of Accounts page and your new account appears in the list. The dialog box you use to create an account. You’ll need to enter expense transactions that have occurred since you received the last statement for this credit card account. In the Navigation bar, choose Transactions → Banking. QBO displays the Bank and Credit Cards page. QBO starts a wizard that helps you connect to a financial institution. On the first wizard page, you either provide your financial institution’s website address, or you click your financial institution’s name if it appears on the page. To expand the search for banks, click the Search Global Banks option at the right edge of the website address box. The screen that appears next depends on whether you typed a web address or clicked one of the popular banks onscreen. Supply your user ID and password and click the Log In button. Follow any additional onscreen prompts you see to finish setting up the account.